Live worship album from Grace Church Port Macquarie. Featuring 11 fresh and anointed songs of Strength and Freedom bringing Glory to God. 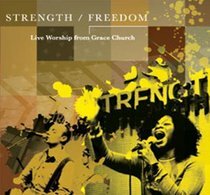 Strength/Freedom CD is just wonderful and truly inspired. It is so uplifting, where in any circumstance I find myself,  fills me with hope, joy and God's love. I love the selection of songs, singers, words, passion etc. for an excellent tool for us to get into God's presence. Publisher Grace Church Port Macquarie T/a Grace Music Aust.